By Manuela Tobias on Wednesday, July 18th, 2018 at 1:27 p.m.
Russian President Vladimir Putin mocked Special Counsel Robert Mueller’s charges of Russian election interference, saying on Fox News that Mueller was training his investigative powers on a small restaurant. "First of all, special counsel (Robert) Mueller has accused a certain private company in Russia that is not even a very big enterprise. The core area of competence is a restaurant," Putin said. "So far, American court has not discovered any trace of interference whatsoever." Putin also mentioned the company by name in his earlier press conference with U.S. President Donald Trump. "We heard accusations towards the firm Concord," Putin said. "As far as I know, this firm hired American lawyers, and all accusations towards it will crumble (or fall apart) in the American court. Just look at what happens in the the American courts. This is what you should rely on, not on rumours. This is first." Whether the accusations will fall apart, as Putin said, remains to be seen. But here’s more context about the company. Putin was talking about Concord Management and Consulting, a company indicted as part of the Mueller probe in February alongside 13 individuals. One of those people was Russian oligarch Evgeny Prigozhin, the owner of Concord with close ties to Putin. Prosecutors charged Concord with funding the Internet Research Agency, the troll factory responsible for spreading falsehoods about Democratic nominee Hillary Clinton and building support of Trump’s campaign on social media. According to the indictment, Concord’s monthly budget for the project was over $1.25 million. The company is not public, so it’s hard to say how much of its revenue comes from its restaurant business. Still, we know it does more than that. Concord, for example, also contracts soldiers to the Russian military. The Anti-Corruption Foundation, a Russian nonprofit run by opposition leader Aleksei Navalny, reported Prigozhin has received contracts from the Russian government worth $3.1 billion in the past five years. The U.S. Treasury Department, first under Barack Obama and later under Trump, sanctioned Prigozhin and Concord for financing Russia's military occupation of Ukraine. Trump also sanctioned them for the propaganda operation. The special counsel’s team accused Concord of failing to register as foreign agents and report election-related expenditures. The company, which was the only responding defendant, pleaded not guilty in May. The indictment simply means a grand jury found sufficient evidence to believe Concord was more likely than not responsible. "There has been a finding that a crime was committed and that these people committed it," said former federal prosecutor Roland Riopelle. "It just is not a criminal conviction yet. That only happens if there is an arrest and a trial." The defendants have not been arrested or tried, however, because they remain in Russia. Putin pointed out the company has American lawyers. Defense attorney Eric Dubelier of Reed Smith filed for a motion to dismiss the case, arguing that Concord is being accused of a "make-believe" crime and that there is no proof that Concord knew of laws requiring foreign agents to file reports with the Justice Department or the Federal Election Commission. Federal prosecutors opposed the motion July 16. The District Court for the District of Columbia has not yet ruled on the pending motions. Judge Dabney Friedrich, a Trump appointee, scheduled a motion hearing for Oct. 10. 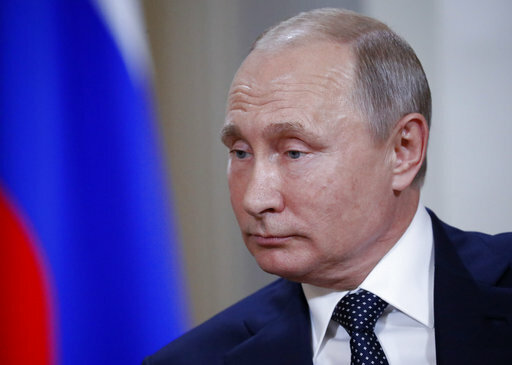 Nikolay Lakhonin, press secretary at the Russian Embassy in Washington, responded to our requests for clarification on the company Putin was discussing, but did not provide evidence the case would fall apart.